In times of falling incomes, the last thing you'd expect is for the stock markets to keep breaking new records and home prices continuing their upward surge. Even the unemployment rate has continued to improve albeit at a snail's pace lately. Surely a bit of positive news can give a glimmer of hope in a climate of widespread gloominess. Some hope. Are we in a 2-speed economy, one in which the 1% are reaping the rewards at the expense of the 99% who are seeing their wealth stagnating, if not falling? No, the economy still operates on one speed, which, right now, is snail speed moving on to stall speed. If you use the analogy of the car, the economy will soon stop moving but it's an incorrect analogy because, no matter what, the economy cannot stand still, it must move. The more appropriate analogy is obviously the plane and we all know, in the hands of an inexperienced pilot, like that of Air France Flight 447 which plunged into the Atlantic Ocean in June 2009, a simple mistake — his was simply trying to keep the plane's nose up in the middle of a stall — could crash a plane. The economy is now losing speed, yet the policymakers look on blithely as wealth continues to move in the direction of the 1%. The only way to gain speed is to quickly reverse the direction of wealth movement just as a plane pilot should point the plane's nose down to avert a stall. But the demise of communism has convinced all economists of the superiority of free market economics that they let the market run its course even when a crash is imminent. Why should we compare the economy to a tragic plane crash? No, it's not meant to be disrespectful to the victims but to show that those tasked with the management of many countries' national economies are equally confused in the face of a major crisis which has yet to pass. However there is a crucial difference. The pilots of the plane could have averted the crash but the political leaders and policymakers have no means of steering the economies to their own liking. They are there to give a semblance of control wherein fact they have no control. They can tweak the movements slightly but the national economies and, by extension, the global economy have their own set course, that is, going downhill. By the way things are progressing, it looks like a crash rather than a smooth descent. However, if our political leaders and economic policymakers can understand issues, forget about coming up with solutions which are anyway beyond their ken, they can at least refrain from making decisions that lead to more aggravations. For example, had they known that the inclination of nation-states was towards fracturing, they wouldn't have instigated the downfall of autocratic Arab regimes. Instead, they wasted money to topple those regimes and, now, realising their colossal blunder, they are throwing more money to prevent the rise of the jihadis. It's obvious that Western leaders lack imagination in both economics and politics. Once the forces of fracturing have been unleashed, you cannot set it back. The only way forward is to legitimise the borders of the new partitioned states in a manner that is consistent with ethnic homogeneity. The price for maintaining ethnic diversity entails much economic wealth, a commodity that is fast disappearing as the economic depression takes hold. Much has been said or written about the growing US economy in the midst of a retrenching global economy. How things have changed. At one time, China was thought to be the growth engine. Now it's switched position with the US. There's no better depiction of the state of the major economies than the HSBC/Markit Manufacturing Purchasing Managers' Index (at left, from The Economist). It may be argued that manufacturing is a minor component of a modern economy but still it provides an advance indication of economic conditions since months before the products are consumed, orders for raw materials would have to be placed. The purchasing managers therefore would've had advance knowledge from their sales teams about future consumer demand. A reading of more than 50 on the PMI indicates that the industry is expanding. Since we're using the plane analogy, we can imagine that the PMI movements as the changing altitudes of the various planes. Since the beginning of this year, the Euro economy has been going all the way downhill. The major Asian economies of Japan, China and India appear to have attempted a climb lately but they're destined to fail. They all have new leaders, the longest at the helm having been in office for less than 2 years but a change of guards is not going to make much difference to the economy which is autopilot driven anyway. The UK economy which has been praised for not being in the Eurozone is starting to lose speed. This has been reflected in its house prices which have started to fall in most places, even in London, one of the most price bullish places for houses. Now we know what has been fuelling the UK economy: easy credit for house purchases. The difference between the UK and the Eurozone is that in the latter you can't easily boost credit growth. The ultimate outcome matters little because the UK now has a deeper hole to get out of. Which explains why the UKIP is gaining strength. And had the Scottish referendum be deferred to next year, Scotland might have got its independence. It's also been claimed that the growing US economy is corroborated by the falling US unemployment rate. The Fed is foolishly buying into this story. 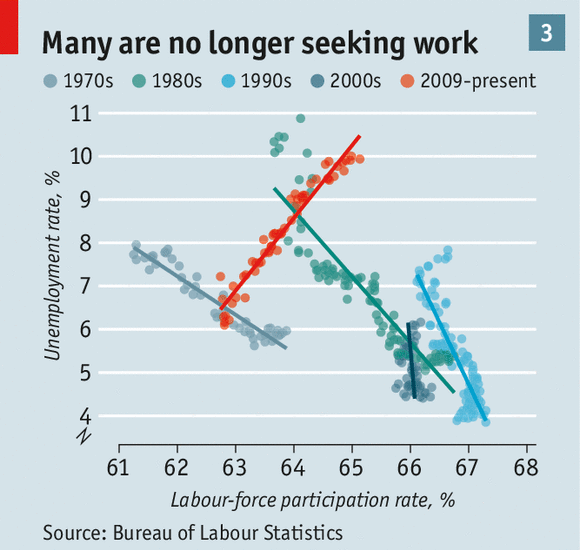 To counter this, we have an interesting chart at left from The Economist which shows a decadal line-of-best-fits scattergraph of the US unemployment and its labour force participation rate. In past recoveries, falling unemployment was accompanied by rising LFPR. Now as unemployment rate falls, the LFPR falls along in lockstep. If we imagine this as a plane with its nose at the higher end of the incline, we can see the US labour market is attempting the impossible. Instead of pointing its nose down, the plane is trying to fly upside down. The US economy or even its labour market is huge, like a lumbering commercial airliner. It is not designed to fly upside down because there's no lift to keep the plane afloat. You should know what comes next. The seeming growth in the US economy in times of falling growth elsewhere can only be explained if we look closely at its credit growth. Under current conditions when wealth circulation is about to seize up, you can have growth only if you juice up credit growth. This does not tackle the crucial problem of failing wealth circulation, it just lets the problem fester much longer at the risk of more serious consequences later. If we look at the US 2nd quarter 2014 GDP, we can see it perked up, only slightly. We should not use the widely reported 4.6% quarter on quarter growth compounded 4 times, because the true measure is the 2.6% year on year growth. 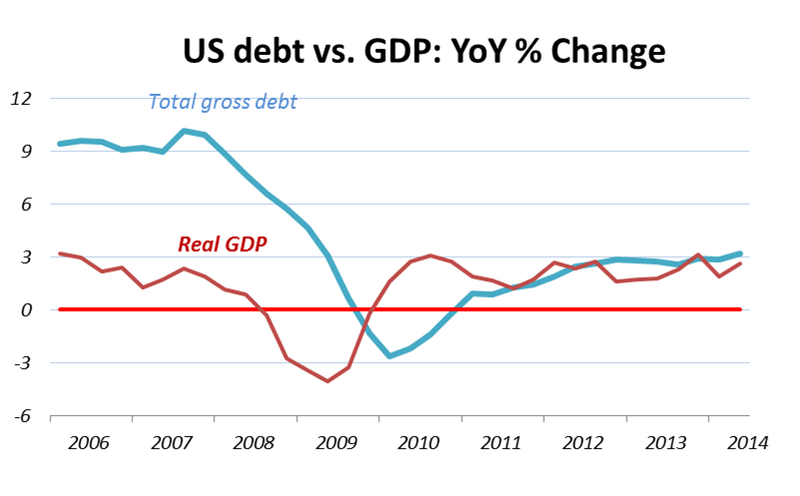 You can see that credit did move up and so did GDP but overall the movement was insipid. Next we need to know which credit component caused the slight uptick in credit. The chart on the left panel above shows the absolute growth in dollars while the right panel the year-on-year growth. 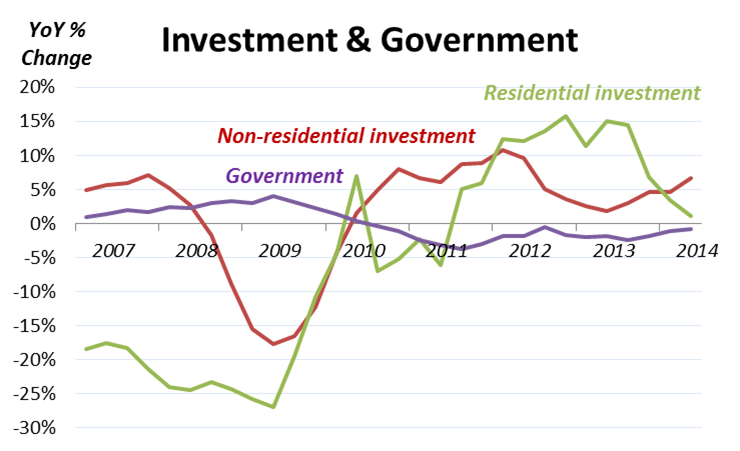 Only two components really drove credit growth: government and non-financial businesses. The rate for government credit growth however has been slowing down since the beginning of the recession. It's only business credit that has been growing on both absolute and relative measures. We now need to follow the trail where this credit growth is being channelled into. 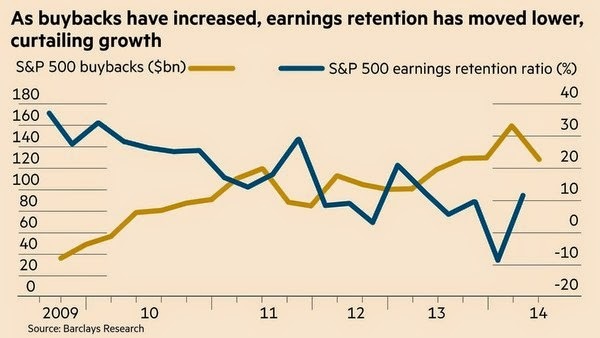 The chart at left from The Financial Times reveals that the corporations have been buying their own shares using borrowed money as evidenced by the falling earnings retention ratio. This explains the recent record notching feats of the equity indices. The share buybacks have slowed down lately which accounts for the sluggish indices. The corporations only began investing in the 2nd quarter of 2014 providing support to the seemingly strong GDP showing (see left chart). But this happened at a time the consumers were retrenching their investment in properties. The government also has been cutting down real spending since 2010 but it still has to borrow as its revenue has never been enough to cover its spending. As long as wealth accumulation flows unidirectionally, the business corporations are more likely to be disappointed with the returns on their investment and we can expect further retrenchment of business investment. Absent business investment, what drivers are there left to boost GDP growth? Certainly not personal consumption expenditure because without household credit growth, PCE cannot autonomously grow. It has to rely on goverment or business credit growth which then funnels the money to consumers for their final consumption. If you look at the household debt chart at left, the most glaring information that you'll glean is that mortgage debt has always been the main driver of household debt growth. 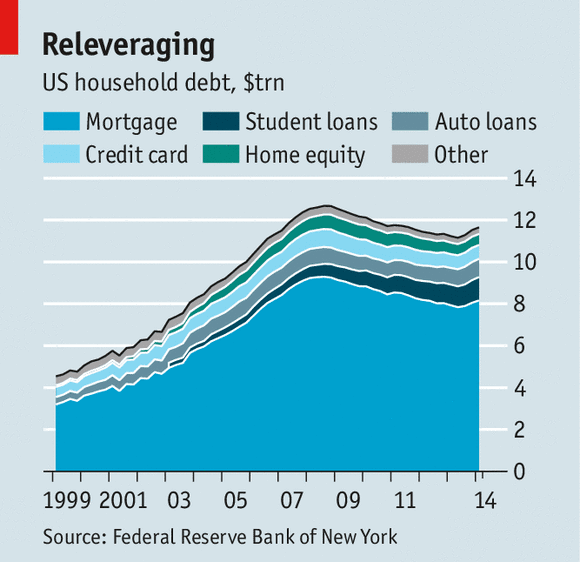 How do you reconcile the falling mortgage debt with the increased residential investment which grew from 2012 to 2013? The only conclusion that you can infer is that while consumers took on more mortgage debts, a bigger amount of old debts were being written off or repaid; between the two, the impact on money supply is still the same: negative credit growth. Wait, there's an uptick towards the end of the chart above. Again, it's a blip. Now in the 2nd quarter of 2014, the growth rate of residential investment fell off the cliff and the Case-Shiller monthly rate of home price increases though positive have been declining four months in a row (May-Aug 2014). If we project the trend further, September 2014 will see a negative growth. Where will the needed credit growth come from? In the plane cockpit, whenever the plane enters a stall, a human voice synthesiser will call out, "Stall, stall, stall", and the pilot must take corrective action. An economy doesn't have that luxury but we can read the crucial gauges that warn us of a stall. 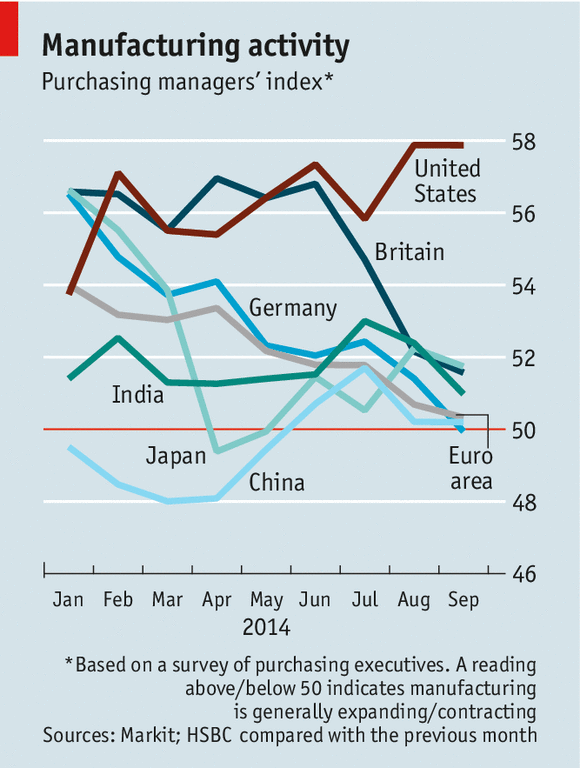 The US economy is alone that's still aloft but it's already in stall mode. Its political leaders think Islamic State is the real threat. Yes it is a threat to all nation-states but it is because all nation-states have been weakened by the coming Grand Depression. No, the real threat is internal; as the economy stalls, the glue that holds nation-states together will start unravelling.